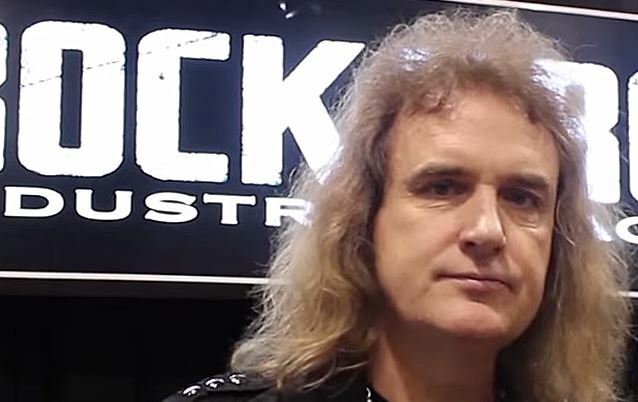 Rock N Roll Industries magazine conducted an interview with MEGADETH bassist David Ellefson at last month's NAMM show in Anaheim, California. You can now watch the chat below. Speaking about MEGADETH's new lineup and the band's plans to record the follow-up to 2013's "Super Collider" album, Ellefson said: "We're actually having a meeting here at NAMM, which I can't tell you anything about. But, yeah, look… The first thing is we have a new album that we're doing. And I think the new album is gonna help determine the lineup, and then from there, everybody will see what that lineup is. So to be continued." MEGADETH has yet to announce replacements for drummer Shawn Drover and guitarist Chris Broderick, who quit the band last year. Only hours after Shawn Drover announced his exit from MEGADETH on November 25, 2014 to "to pursue [his] own musical interests," Broderick revealed he also quit the legendary metal band, saying that he was leaving the group "due to artistic and musical differences." Broderick joined MEGADETH in late 2007 as the replacement for Glen Drover, who left the group in order to focus on family life. Shawn joined MEGADETH in 2004 as the replacement for Nick Menza, who had only just rejoined the group. Drover performed on four MEGADETH studio records: 2007's "United Abominations", 2009's "Endgame", 2011's "TH1RT3EN" and "Super Collider".